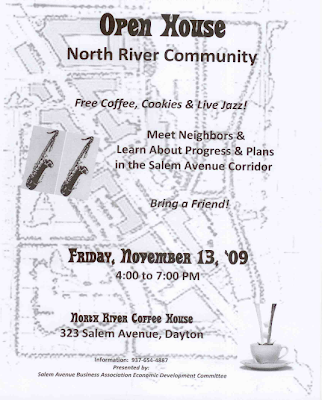 The North River Coffee House is hosting an open house with free coffee, cookies and live Jazz. Also an opportunity to hear about economic development efforts in the area from the Salem Avenue Business Association Economic Development Committee. Here's a little geography for those unfamiliar with the area. According to a study by some folks at Wright State, the 'North River Corridor' extends along Salem Ave from the Great Miami River to Catalpa Dr.